Trading takes many forms, some of which are more beneficial than others. Furthermore, almost anything can be traded, whether it be the newest Xbox that you are selling at a profit, or shares of Apple stock. When it comes to making profits, the place to be is within the financial markets. There are four main types of assets that are typically traded over the short term: stocks, indices, commodities, and currency pairs. If you’re interested in making money in the world of finance, you have a few major choices to make. First, you need to know what your timeframe is. Some people put money in the market and then leave it there for twenty years or longer. This is not trading; it’s investing. Trading focuses on transactions that last less than a month, for the most part. Short term trading is way different than investing. There are plenty of other things that need to be taken into account when doing it. Next, you need to focus on making it worthwhile. Trading $10 in the stock market is not worth your time, especially after paying the fees to close your position. Selling a stock usually costs $15 to $20, so, unless you had an amazing breakthrough, you’re going to lose money. In other words, a smart approach is needed if you want to make sure that you’re going to turn a profit on this. For traders, there are a few main ways to trade. There is the stock market, which would let you trade both stocks and indices through a stockbroker, the Forex market, where currency pairs are traded, and the binary options market, where you can trade stocks, every major index, currencies, and commodities. Commodities, for the most part, are not easily traded through a commodities broker because of the cost associated with futures contracts. All of them have their own specific formations. Let’s look at all three types in a bit more detail. The stock market is expensive. If you want to trade a stock, you will need to either buy a huge quantity of it, or time it perfectly and hope for unusual momentum so that you can make a worthwhile profit. Most stocks hardly ever move more than 2 percent in a day, and with $100 invested, this is just $2. Therefore, for this to be worthwhile for you, you would need to trade a lot more than that. Now, factor in commission costs, and you need much more money. In fact, a day trading account cannot even be opened unless you have more than $25,000 in the account–even after you make your trades for the day. The beauty of trading within the Forex market is that you can open up an account for pretty cheap, and use leverage to multiply your profits quickly. This is also the negative factor of Forex trading. Using leverage can give you huge profits, and huge losses, if you’re not careful. This is why you need to work on your timing, use trading stops to make sure that things never spiral out of control on you mid-trade, and never use more leverage than you can comfortably afford. The point is to help you, not hurt you, but many new traders misuse leverage and it costs them. Trading currencies, though, is a great short term type of trading. It allows you to make a lot of money off of tiny fluctuations in the value of the currencies you are trading. You should always go with the broker that has the best spread (the difference between the buying and selling prices of a pair) so that you can minimize your costs. The spread is how Forex brokers make money, and it makes it difficult for some to make short term profits. However, comparison shopping in the Forex market, plus studying price movement so that you always have a good idea of how prices will move over the course of the day will give you a much better chance of making a profit here. Forex brokers also offer many ways for you to automate your trading, which is great for people that want to be able to walk away from the computer and still keep making money. This is a newer type of trading compared to the other two, but has a ton of potential. Like the Forex market, you can get started with a small amount of money, and like the Forex market, there is potential for big rewards. You are also able to trade currency movement here, as well as stocks, indices, and commodities. It is an all in one type of trading, as well as an all or nothing type. You can make 75 to 80 percent profits on a single trade, but you can also lose 100 percent of what you risk. Timeframes are flexible for this, but once you lock in a trade, these cannot be changed. 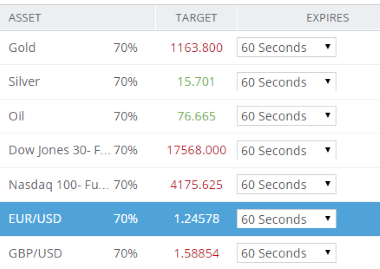 So, if you decide to trade $100 on EUR/USD going up, you can make $75 in 5 minutes if this is what you choose, but if the price goes in the opposite direction, then you will lose all $100. It’s a fine line, but when trends are clear, it can be very profitable. Trading is tough, especially if you want to make sizeable profits. But that doesn’t mean it’s not possible. With study, effort, and testing out new ideas in safe ways, you can learn what it takes to be successful with this and adapt a style that works for you and your financial situation.